Are you a Millennial? Generation X? A Baby Boomer? Every generation gets its own generalizations. You know which apply to you and which don’t. If you’re managing Millennials, that’s a good starting point: Recognize that they’re all individuals, just like you (even if you’re a millennial yourself). That said, some traditional management techniques are likely to fall flat with this group. If you want their best efforts, you’ll need to pay special attention to what works. 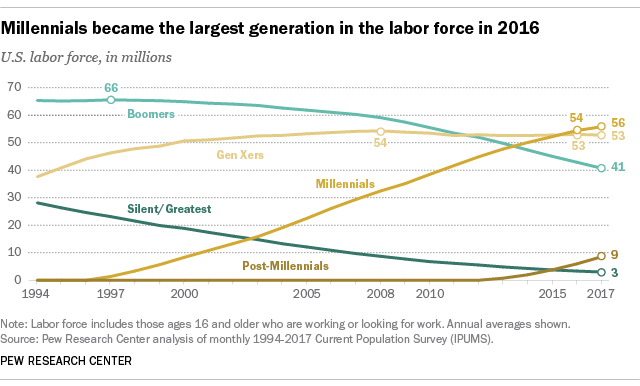 Millennials are the largest generation in the workforce, according to the Pew Research Center. Start there: You have the most control over yourself, so consider your current management style and practices, and align them with those three characteristics: Are you ethical, transparent, and consistent? Next, consider your management; these traits should be clearly evident with them as well. If not, then you know where to start. If you’re managing Millennials, merely matching employee skills to your organization’s needs won’t cut it. You need to lead not just by example, but as a mentor. Most Millennials value environments that aid in their personal and professional development. Showing interest in your colleagues’ career development and training pays off both in the development itself and in morale and retention. Similarly, display a consistent vision for your organization, and tie their individual roles to that vision. If you think that your service, perhaps in partnership with your clients, makes the world better, link that outcome clearly to your colleagues’ personal contributions. Leaders who inspire their millennial colleagues in this way will get better results than those who think strictly in terms of roles and responsibilities. Many Millennials who were asked about their workplace preferences say that they work better in groups. If your workforce is multi-generational and otherwise diverse, emphasizing what individuals have in common can help set the tone for a collaborative work environment. While difficult, the results are worth it; as the Harvard Business Review has noted, diverse teams are smarter and more creative. If your team’s collaboration could use some help, turn to them for guidance on what causes the most friction. Millennials surveyed by IBM were more likely than other generations to consider the freedom to innovate necessary to be engaged at work. So allow them to be part of the solution. While they have a reputation for constant texting, Millennials don’t always prefer using technology to communicate. Many of them value being in the same space as their colleagues. This can help you when considering how your team approaches training; you may wish to use on-the-job training rather than solo-study. When learning new work skills, the largest number of millennial respondents preferred attending third-party sponsored events and conferences, as contrasted with meeting online. In-person classroom training and working alongside knowledgeable colleagues were a close second and third. So overall if you’re training Millennials, you’ll probably get the best response out of having an expert in the room. Work / Life balance comes up again and again in discussions of managing Millennials in the workforce. It’s so important that Millennials say they are willing to sacrifice pay to achieve it. If you’re strictly a 9-to-5 shop that requires all employees to be on-site, it could put you at a disadvantage in hiring and retention. Consider work-from-home or other remote-working options, as well as flex-time. You’ll draw candidates from a larger pool than those close to your facilities. You’ll also have a higher retention rate. Having consideration for your employees’ time is a recognition that their work is valuable enough for you to accommodate differences in work preferences. Most remote positions also mean lower support costs for employers. Millennials share their opinions freely. If your shop’s managers can’t handle questioning, there will be friction. Be prepared to give the reason behind decisions and policies. You spend a lot on attracting and keeping your best people. So if there’s a conflict in your team, it’s best to address everyone’s concerns and keep people onboard. There should be a fair process in place to handle it all, distributed to and agreed upon by all teammates at hire. Make sure HR is on top of it. Only 58% of Millennials surveyed by IBM felt that their organization’s leaders recognized the employee’s accomplishments. Using the management strategies and tactics discussed here can help improve your community culture and turn that feeling around. One way to recognize workers effectively, transparently, and publicly is with a clearly-defined, company-wide recognition program, with high-quality rewards (think high-end clothing, not plastic trinkets) tied specifically to metrics-based achievements. If the rewards are co-branded with a message or theme, peers of those recognized can compliment the recipient, perhaps asking how they scored the sweet swag. Word of mouth will do the rest. Make sure that recognition programs include rewards that appeal specifically to Millennials. This is part of using recognition programs strategically; the rewards need to be something your workforce actually wants, so a lifetime supply of t-shirts is probably not the best choice. Inproma’s recognition and rewards systems are perfect for getting Millennials engaged at work. We create custom plans for organizations, tying recognition and rewards clearly to the KPIs and metrics you choose. Inproma has helped companies achieve their strategic goals for 20 years. If your organization has a lot of Millennials, needs help reaching specific metrics, or just needs a rewards program that works, we should talk. PreviousPrevious post:Advantages and Disadvantages of Employee Engagement SurveysNextNext post:What Are The Limitations of Employee Engagement?